Expert advice for helping an applicant's chances of acceptance by choosing the right words and phrases As a teacher, professor, or an employer, you are often called upon for letters of recommendation--and probably as often find yourself stumped about what to say. It can be a daunting task when someone's future is in the balance. 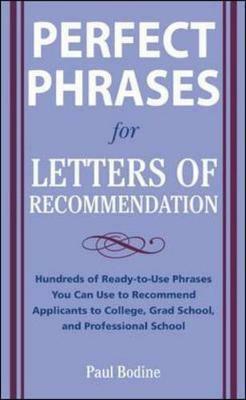 This book, written by a writing expert, will help you find the right words--and avoid the pitfalls--of creating a letter of recommendation. Author Paul Bodine explains what makes a recommendation letter good and also what can make it ineffective. 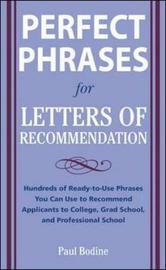 The book contains paragraph-length examples of effective recommendation letter writing for all types of situations.